Yeay! This weekend I got more wishes hahah.. got another cute mug Lembu form Dgon plak this time and a dinosaur keychain hehe.. Then my housemate gave me a diary (?) Adeh! Nak wat pe ngan diary.. never kept a diary my whole life but thanx anyway to Rusya :) Nnt akak wat la buku ape².. So Saturday I went to Dgon's with Rusya and we watched the midnight showing of L Change The World. Dulu first heard about Death Note from Pojie and though the way he told me about the anime was interesting, I didn't exactly feel like going out to find a few episodes for my own viewing. Then bile tanye kat Ikram, upenye dia and Adi dah lame gak ikut citer tu.. hahah, Ayu sungguh ketinggalan, tp tak kisah la :) I still haven't watched the series, setakat tgk yang movie punye je but I like all three instalments, wpun citer L tu cam dah lari skit la..
Dgon is gonna go back to Pahang by early April so I didn't know what to buy for her birthday (watching L was actually our way of celebrating her birthday since Dgon is someone whom I think should've been born in Japan by the way she's 'obsessed' with anything Japanese hehe..). Walking around Parit Buntar, I remembered when we went to this fabric shop and she was looking at this beautiful piece of cloth while telling me that her sister had already told her about their 'raya theme' this year but she was afraid if she couldn't afford to buy anything since she was quitting her job.. so, the most simple thing I could think of was to buy the cloth she was admiring and I'm glad she liked it..
Thing is, some people say, giving a cloth to someone is not advisable as old folks tale say that it means you'll be separated from that person in the future. Hmm, alang² Dgon mmg nak pindah pun kan, bagi je laaaa.. tul tak? Heheh.. Happy birthday to me!!! Hehe.. I know this is a quite belated entry but I just couldn't resist..
Actually, I had already known that they were planning a suprise for me (sorry Puga..) as Farah, whom I now know as someone who can't keep a suprise to herself hahah, had told me the day before that they were planning a suprise for me.. duh!! Dah tak suprise dah la cik Farah oiiii.. but ok, I jusy played along (as I did for the past few years jugak where I'd ALWAYS know about it before hand.. sheesh! Can't a girl have her suprises now and then heheh..).. So well, to let them prepare their 'suprise', I decided to ask Salimin to go with me to Kulim to buy the nasik ayam dot my (my favourite!). Initially, Farah wanted to go with me but she already told me she can't go because they wanted to do a suprise (hahah.. thats how I knew!). Had a long talk with Salimin. This lil brother of mine dah nak balik Sarawak dah so banyak la nak sembang ngan dia. Besides, lame dah tak merepek² with him..
Then, as I arrived at school.. well, I'll give it to Puga, I had expected a cake but I didn't expect a roomful of balloons heheh.. so thanx! See the table they used. Curik meje Yee, mentang² la amoi tu tak datang school aritu, then got a table cloth from the pantry. Sanggup korg angkat meje beso and berat tu ek hehe.. sgt sweet! Okay, sile abaikan the way I look, ni gambo candid from abg Fadzil, tak sempat nak senyum lawo² hehe..
And this is the spread. Notice that I have two cakes? Heheh.. apparently, my fellow postgrads weren't the only ones planning a suprise for me. And according to Farah, they had met with kak Sue and kak Bibah (from my colleagues in HiTEG) at the cakeshop near my tuition centre which is my favourite bakery here. But get this.. because I have 2 cakes, I was 'required' to blow out a total of 56 candles. Talk about feeling young.. just look at what they did to my self-esteem by asking me to blow out 56 candles.. sheesh!! The rows of individual trifle pudding is courtesy of Shahril who got the recipe from me (nak bgtau jugak tuuu recipe dia!). Sekarang dia dah lupe cake chocolate sedap dia, asyik nak wat trifle pudding je pulakk.. While the kacang², cake and sweets semua tu sponsored by postgraduates yang kalau tak silap, the main organizer is my dear Puga. Co-organized by abg Fadzil, Choong, Farah, Ad, Remy, Shahril.. uhh, Puga, akak ade tertinggal sesape tak? And ni muke² happy dapat makan byk hari tu (eh, nape my nasik ayam yg 36 bungkus tu takde dlm gambo ek? ): Abg Fadzil, Rashwan, Rini and Farah. Anyway, they really managed to make me smile the whole day.. this family I have in the School of Civil Engineering, and I love them all!!! And for my birthday, there's a list of people who remembered (ikut turutan ni rasenye) and who I'd like to thank from my heart..
Kak Wahid.. who promised to give me a boyfriend for my birthday hahah..
Salimin.. thanx for the gift! kak Win.. mug kak Win chumel la.. ade lembu kaki tergantung huhu.. sgt chumel tp sayang nak gune! My cousin Ikah.. camne dia tau ek? Helmi.. mekasih ek call.. tp ade dlm bank aritu.. sowi! Irnis.. thanx for the gift. Klau dah dealer Tupperware, adiah pun brand Tupperware gak ek hehe.. thanx!! Kad tu siap Umar tandatangan tu.. terre²! And sesape yang tertinggal name.. adeh! Ayu baru umo 17, camne leh lupe? Yesterday I went to see Baizurah's newborn son. 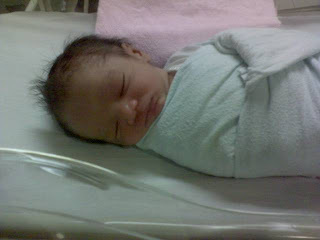 Muhammad Aqil Irfan.. hmm, dah tak jadi buh name Adam ke, Sentot? Heheh..
On Saturday, I had a conversation with one of my students, Nusaibah. Nusaibah: Teacher, hari tu saya nampak teacher kat traffic light! Nusaibah: Mase tu saya ngan mak ayah saya, diorg pun nampak teacher..
Nusaibah: Ayah saya tanye, teacher memang suke joget ek dalam keter? Sheesh! They must've caught me singing in the car.. and since my current favourite song is With You by Chris Brown (I keep repeating it in the car hahah..), and you know that song is quite catchy (ye ke? ), they must've seen me singing that song. Yeah, I had to give a 'saya-malu' smile at Nusaibah while my other students questioned her on 'camne rupe cikgu mase tu'.. cisss, sungguh malu! But I was laughing inside hahahah..
Today is only the 24th of March but believe it or not, I've already received 4 birthday wishes from last Friday lagi hahaha..
First one bleh dimaafkan, from Jida. She was on her way back from Lumut so singgah sini jap and ajak minum² kat Riyas. Then she gave me my very first birthday present for this year yg ade rupe ala² bende beli kat gift shop Lumut/Pangkor heheh.. Penuh seashells heheh..
Second one yg paling tak tahan. I just got back from my tuition class on Saturday night, then went out with Winnie and Fared to get something to eat before sending Fared to the bus station so sangat lambat lah balik rumah. Around 12am tu baru abis mandi n nak solat. Mid way through my prayers, dengar la bunyi phone. 2 kali jugak kot klau tak silap n risau jugak ingt emergency ape. Turned out it was Pojie so I called him back la tanye nape..
And he suprised me by wishing happy birthday.. yang telah manjadikan diriku konpius kerane birthday ku belum tibe lagi hahahahah! Third one from Izham a.k.a Chique Am. Yesterday while at Baizurah's, my phone shut off itself becoz the usual reason of me not checking to see my battery level before I went out. Then I went home and stayed till 11.30pm before heading back to Nibong Tebal. As I arrived home, I quickly charged my phone and switched it on, resulting it in having a stream of messages coming in. One of them was from Chik Am wishing me a happy birthday (it was 12.30am when I arrived home) and promising that he'd give me my card later. I had to laugh as, you guessed it, its still NOT my birthday yet hahahah! Forth one was just now, tetibe Puga wished me happy birthday.. alaaa, nape sumer org salah hari nii?? I'm actually a VERY lucky girl!! Dining utensils or bare hands? I'm one of those tak sedar diri Malays who SELDOM watch Malay soap operas. Whenever I watch them, I'd be criticizing (I don't think I got the spelling right there!) everything hahah.. Cube bagi Ayu buat citer, tgk jadi ke tak heheh.. cam terre but still, most of us know Malay punye sgt typical so agak bosan la for me. Anyway, last week, I came back from work a bit late and sangat penat nak masuk bilik so I flicked on the tv. There was this thing playing on the tv and for the reason of nothing else better, I watched it. In one of the scenes, this boy asked this girl out. Kunun² this girl from 'kampung' la kot coz this guy's mum said to him, "Nak bawak dia pergi restoran 5-star ke? Hmm, pastikan dia pegang sudu dan garfu (or was it 'pisau dan garfu? ')di tangan yang betul.."
You know, a few years ago I went out with a few friends (and their friends) and we decided to go eat at this new Western restaurant. While eating, I noticed this girl (an-almost friend of mine) smirking at me while watching me eat. I was feeling a bit uncomfy and was wondering if I had sauce on my chin or something when she suddenly blurted out, "Ayu ni, mesti tak biase makan Western kan? Kesian pulak saya tengok.."
I was like, "You kidding me?".. inside my head la of course. Instead, I gave an overly sweet smile st her and asked her why.. Know what she said? She said, I dunno how to eat like a Westerner. Gesturing to her own hands, she told me, to eat Western food, you have to hold your knife in you right hand and fork in your left hand.. thus, in this arrangement, its also proper to eat with your left hand as opposed to our Sunnah to eat with our right hand. When I was quiet, she went on and on about how weird I am and how people must laugh watching me eat as I'm not proper..
..but I managed to give her a smile before excusing myself to the ladies! When I was more calm, I went back to the table and asked her if she was right-handed or left-handed. And she was like the majority of the world who are right-handed so in an equally calm manner (just like the time she told me off for being 'weird') I told her, the knife is used for cutting up the pieces of food (or for stabbing her eye, if I choose to do so!) so how am I supposed to do a neat job of cutting if I use my weaker right-hand, thus the reason for me using my left hand. Well, okay.. actually, I don't care if she eats with her right hand or left hand or with her feet pun, lantak le ikut suke hati dia. But I was annoyed when she told me I looked like some uncivilised person when I used the WRONG hands for my utensils. Sheesh! Then she defended herself by saying, in Western tv shows, everyone eats with their left hand.. hah!!! Tv shows? Huh.. berlagak cam hape.. upenye sbb tgk tv je ke.. ceh! Ingatkan amik ettique course ke hape ke.. Its not like I was eating like a caveman (camne ek caveman makan?) ke ape ke.. mende ahhhhh! Now, I always eat my pizza with my bare hands. I know some people prefer to eat it with a fork and knife coz they don't want to dirty their hand or have smelly hands afterward, suke hati korang la kan though I really think eating with your bare hands is more satisfying but thats just me and my humble opinion. As we sat down to fill in our tummies, I was laughing at B who looked so awkward eating his slice. The truth is, B is actually a very shy guy so that was the real reason behind him looking like he was not used to eating with his bare hands. Puga kept scolding me but I kept on teasing the shy B making him even more embarassed hahah.. Towards the end of the meal, I finally noticed G had eaten her share with her bare hands (she usually uses a fork and knife). Then, as we were are complaining of our full stomachs, G suddenly said, "Tak sangka pulak makan piza ngan tangan lagi puas.. tapi klau omputih tgk kite makan, depe mesti gelak kan kite kan sbb kite macam orang tak betul makan ngan tangan.."
And once again.. What the hell? She went on again about, kesian B, dia malu nak makan ngan tangan.. and I dunno, guess I was still pissed with the earlier incident (yang sudah bertahun berlalu sebenarnye hahah <--Ayu sgt teruk!). I just looked and her and said, "Pizza memang makan ngan tangan laaaaa! 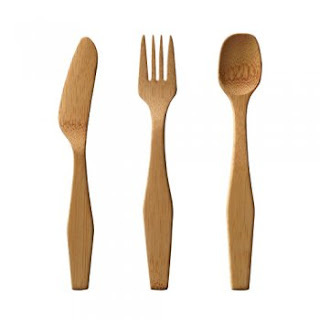 Orang Melayu je berlagak nak makan ngan fork and knife!" A bit harsh maybe.. adeh! Ayu sgt sensitip and bertambah teruk hahah!!! I mean for one thing, ade ke cakap camtu.. kot Italians yang gelak tgk org makan piza ngan fork and knife. Its considered finger food kan.. and like its namesake, its meant to be eaten with your fingers.. (just for arguments sake, I looked in wikipedia hahah --> http://en.wikipedia.org/wiki/Finger_food Notice that pizza is 'listed' there?). I mean, would you eat your Fillet-O-Fish with a fork and knife? Sheesh!! Kenape kene fikir, all foreign food kene makan with fork and knife and spoon?!?! Besides, it made me wonder what did she think of me everytime we went for a pizza (which is very often) as I ALWAYS eat with my bare hands. Ntah² she had the same thought as my almost-friend kat atas tu.. and I'm kinda sensitive about that issue till now hahah..
Takde la, c'mon la.. Kenape kene fikir teruk² pasal cara nak makan.. makan je la. Dlm perut nnt same je.. kuar nnt pun same je! Like dulu when KFC gives out fork and knife whenever we dine-in. Ade ke tengok orang keliling makan finger-licken' fried chicken with a fork and knife?! Get real la you guys, puas ke makan camtu? Tapi seriously, I don't give a damn on how you guys wanna eat, just stop criticizing the way I eat la.. its not as if I eat sloppily ke eat with my nostrils ke ape ke. Okay la, sometimes my hijab does get smeared with sauce or curry (like some people have personally seen hahah..), but its not as if I'm eating cam orang tatau makan. Let me eat with my hands.. you guys can eat with your shoes for all I care! And seriously, when I think about it, why do I even have to explain myself to the people of the likes of my almost-friend and G.. sheesh! Those kinda people bring out the worst in me..
Ohhh.. Ayu sangat jatuh cinte ngan Chris Daughtry hahaha.. I dunno why his songs that are always on air are really great.. at least to me la! I really wanna buy the CD but takut jadik cam 98 Degrees when I was waiting for my SPM results. Dengar 3 songs in the radio cam bes, but when I bought the album, adeh, ONLY those three songs je yang besh! Sungguh kecewe.. Anyway, tadi mase searching for the lyrics, turned out, lagu ni masuk Wikipedia hahah --> http://en.wikipedia.org/wiki/Feels_Like_Tonight.. ke all songs masuk Wiki tapi Ayu tatau ek? Spring cleaning my blog hehe..
Hmm.. lame dah tak update. Nearly two weeks, huh? Sgt la busy the past few weeks.. byk bende kene settle before.. Still, a bit risau gak mule tu. Just a week before, all drivers of Rapid Penang were on strike. So they were a bit wary in cooperating with us at first but after we expained, diorg ok la jugak.. Then, the next week, they started to question us even more. I was even 'locked' in the bus with the driver when he persisted that I answer him truthfully.. gile takut time tu! Then lepas baru tahu, the previous week, Ramadhan (he didn't go the next week, sbb tu dia wat hal) told those drivers that we were sending the data to their HQ. Gile nye marah kat Ramadhan. Dah tau it was a sensitive issue to them, gi acah² diorg nape.. last² me and kak Sue yg kene question.. But very penat la.. dah lame tak naik bas satu hal. Then kene naik the same bus, same route, 3 times the whole day.. b.o.s.a.n! Still, my PhD nye data nnt laaaaaaaaaaaaaaaagi bosan.. sape la nak tolong nanti.. uwaaaaaaaaaaaaaa!! Nway, she once contacted me just to ask, "Ayu, aku xpaham la sbb apa rocket naik tak straight? Ataupun dia straight pastu turn ke destination? Sbb apa kena pusing bumi byk kali?".. which left me speechless hahaha.. I mean, aiyoooo Shahnaz, form 5 physics isn't actually rocket science and bayangkan Ayu sendiri pun tatau dia straight tak straight ke, pusing 10 kali ke hahah.. terpakse mengaku ngan humble nye, I tgk 'abg Mus' jadik astronaut je.. tak tgk rocket dia pun hahaha..
Then another time, she called asking me, when a boy plays football, what kind of energy does he use? Kinetics? Mende tah tenage ape lagi.. dah Ayu nganga lagi.. Adeh! Awak buat saya rase bodoh la Shahnaz heheh.. So when the phone rang again, Ayu memandang phone dengan rase gerun sambil berfikir, "Soklan pe plak la si Shahnaz ni nak tanye?" Turns out, she was searching for a tutor.. fuh! Lege heheh..
Ok la.. got work to do.. Uhhh, penat la bile byk bende kene prepare ye.. lagpiun sbnrnye takde idea nak bebel dah heheh.. chiow!